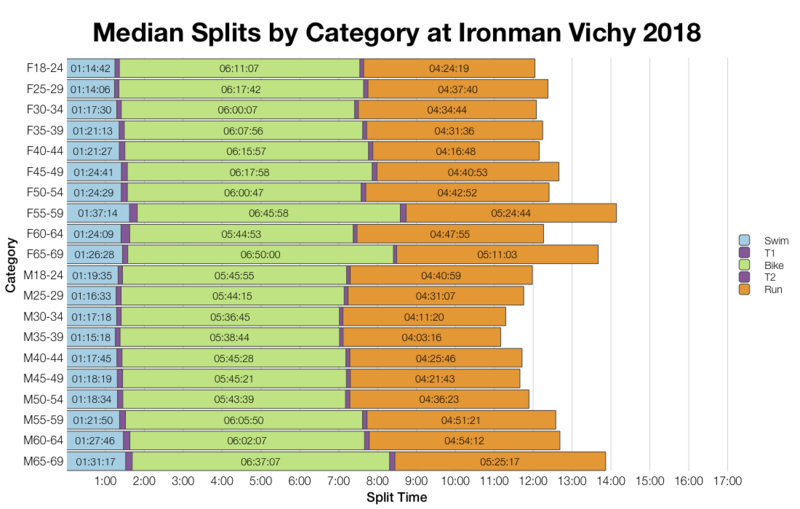 This week’s Ironman race analysis if for Ironman Vichy. 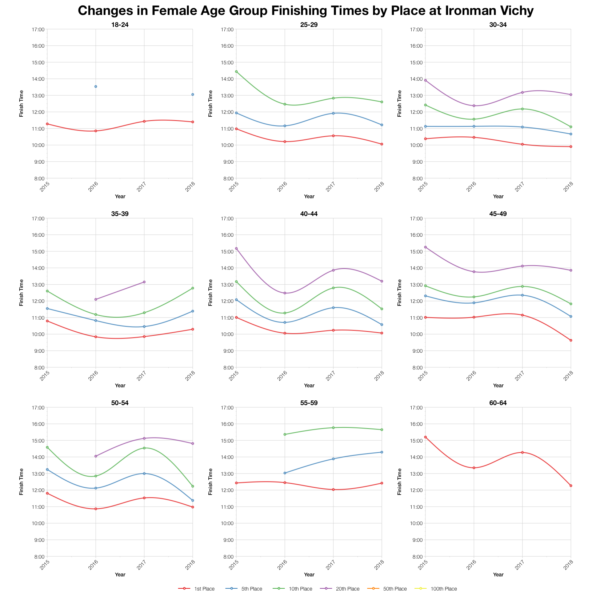 Now in its fourth year as an Ironman, Vichy is a midsize race with around 1300 competitors for the first Kona slots of 2019. This year’s race results look to be typical for the course. 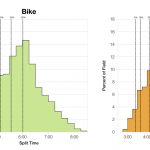 The split distributions trend slightly faster on swim and run to a significant enough extent that the overall distribution is also faster. It’s not a huge shift and the amalgamated results may be influenced by a slower race back in 2015. We’ll see in the position trends later how the last 3 years mostly line up. As you can see above, 2015 had an exceptionally high DNF rate on the run, clearly conditions weren’t favourable that year. 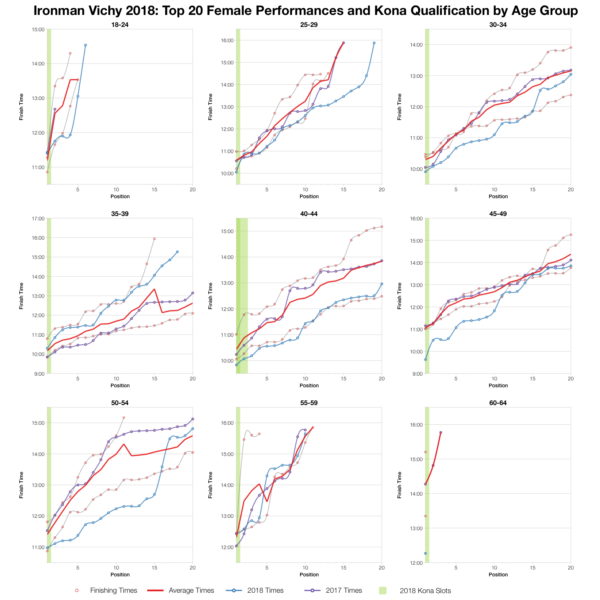 2018 is at the levels we expect to see at most Ironman races, all within normal bounds for DNF rates. 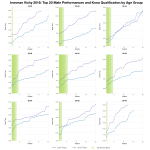 As with the distributions swim and run times do trend a little faster over most age groups. Bike medians tend to fall inline with previous years of racing at Vichy. A wide spread of Europeans race in Vichy with the slots spread quite wide over them. About half the athletes are French, but a quarter of slots stay in France. 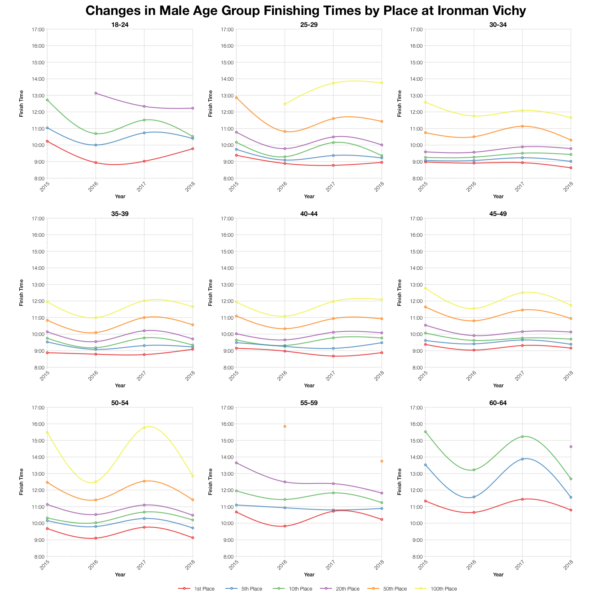 Tracking the changes in times by position and age group shows how 2015 was a clearly slower year. Since then times have settled a little and there’s less year-on-year variation. that said, this year’s race looks to come in faster than last years. 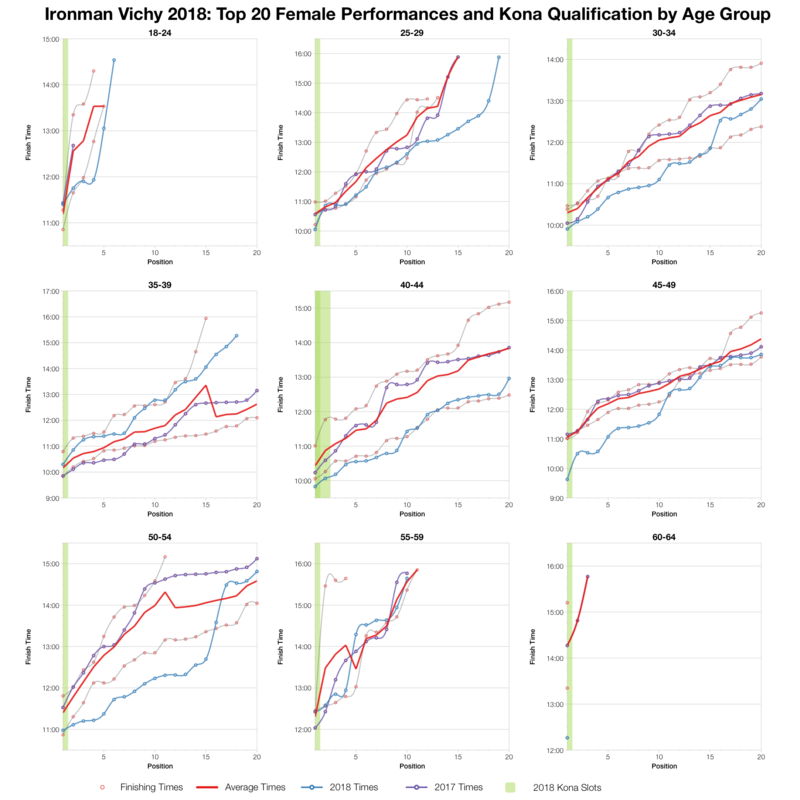 Based on the athlete list for this race I’ve estimated the Kona slot allocation and from that the automatic qualifying times. Final numbers and roll down will affect these times. You can compare with other races on my Kona qualification page. 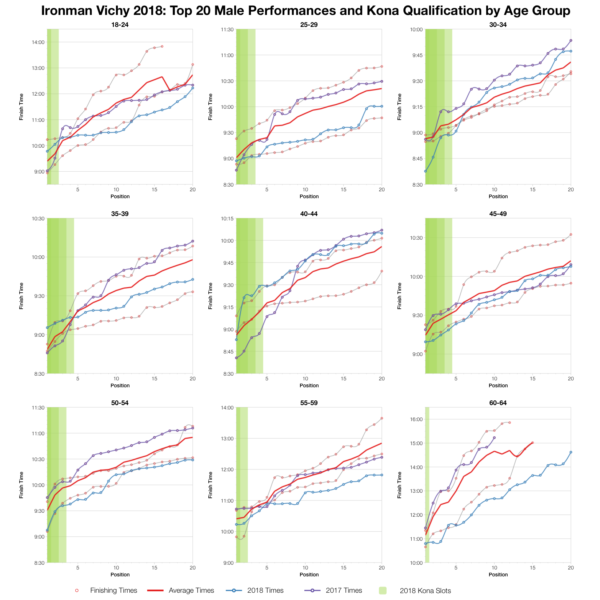 Age group top twenty times show a lot of variability. There’s a stronger trend towards faster times among the female age groups, but this isn’t as clear cut for the men. 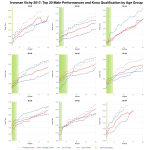 certain age groups were faster, some were slower and some float around the averages. 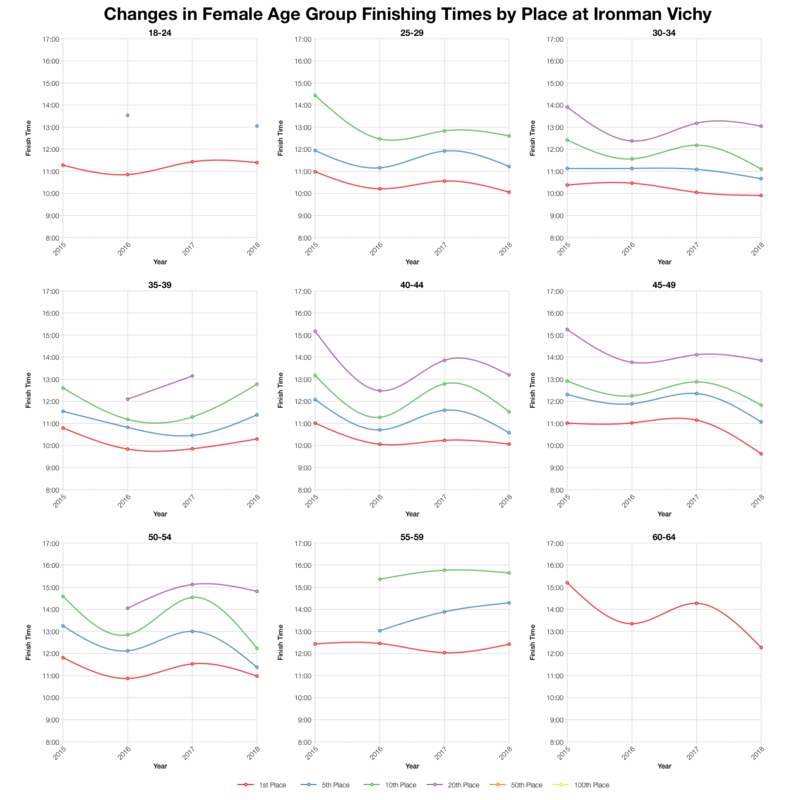 If Vichy was faster this year, it wasn’t by much overall. 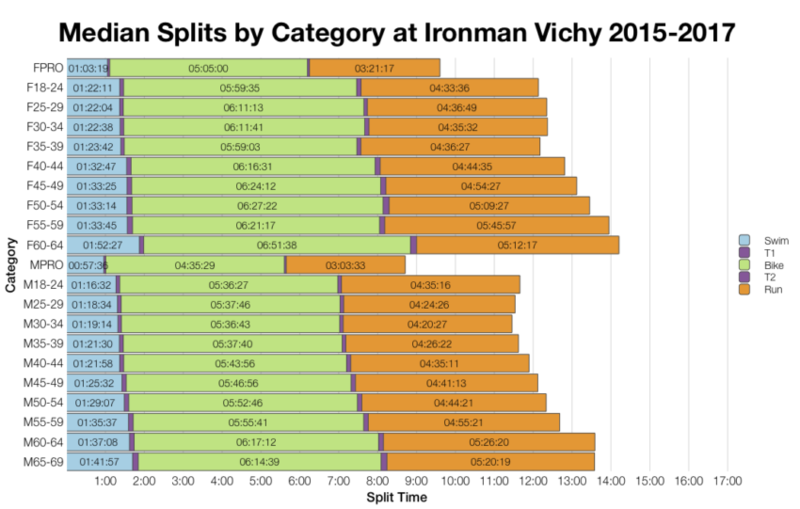 You can access a spreadsheet of the full results from Ironman Vichy 2018 on my Google Drive.